Here’s how our learning process helped us prepare for Magento 2! When it comes to Magento 2, early adopters from our company started with their blog posts back in late 2014, e.g. Filip Svetličić wrote about Magento 2 frontend architecture in September 2014, Marko Martinović had detailed review of Magento 2 caching features as a conference speaker at Meet Magento Poland in November, Stjepan Udovičić wrote about basics of dependency injection and its usage in Magento 2 in December and Domagoj Potkoč covered Magento 2 logging in January 2015. 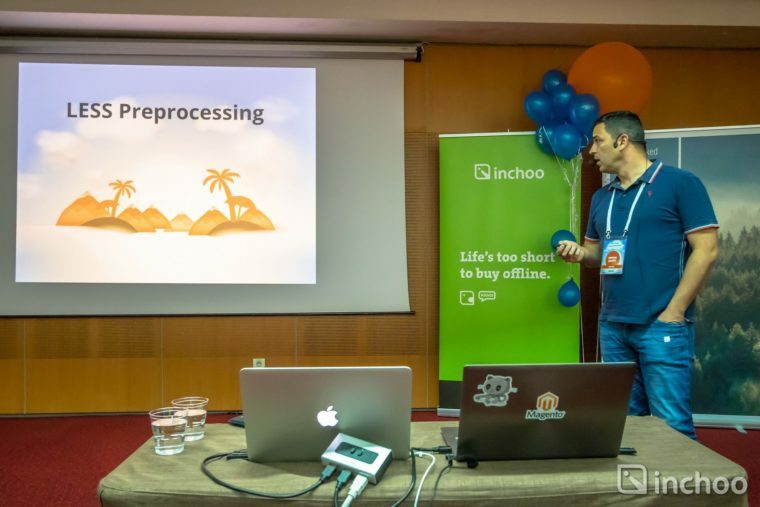 Back in mid 2015 the focus was on migration planning, so in August Ivan Weiler wrote about testing Magento 2 Data Migration Tool, and Ivona Namjesnik addressed merchants with Talking Merchants: Migrating to Magento 2 blog post. At the same time, our early adopters prepared an in-house Magento 2 workshop for backend developers, all in favor of sharing findings and thoughts with all of them. Through that entire learning process we created our own learning materials, and we used them together with the MagentoU official educational materials while training our teams for the Magento 2. And when I talk about in-house trainings and say “we”, it usually means Ivan Weiler, our guy for in-house education. He works with our newcomers to help them with smoother integration in the company and technologies we work with, but also helps our teams when he believes its needed. Educations come in two forms – separate trainings (for Frontend developers, Backend developers, certain team) or a lecture/workshop for the whole company. After Magento officially scheduled the date of Magento 2 release for the November of 2015, and we had Developers Paradise preparations going on for April 2016, we decided that we’ll turn it into a Magento 2 conference! There was enough time between the release and the conference for the first impressions, so we knew that a well-chosen topic should (and will) provoke quality discussions, especially because we had few guys from the core team as speakers! We like to mix learning methods – here’s which ones we love! In reality, of course, blog posts will get you so far. While 2016 was all about various methods of learning (such as organizing conferences and a whole lot of in-house educations), we love seeing our developers taking it all a step farther. Well researched topic can be a great blog post, but also an amazing conference topic and can get you some points on your Magento certification exam! So, I feel I should mention the following two things which help Inchooers learn and evolve! Certifications are important step in our learning curve. MCD+, MCFD, MCSS… We tend to send every employee to take a Magento certificate (or more of them because hey, the more, the merrier!)! Even our designers and marketing & sales guys have a confirmation of knowing how to handle your Magento store. It’s important for understanding of our core business and helps with communication on the projects. Conference speaking is also encouraged, so if you like to talk about what you do and how you do it, or you’ve never done it but you would like to try – just find a conference and apply a topic! It’s a great experience for a personal and professional growth, and a good value for the company itself. All this steps are quite important to us. Although there is no strict and linear learning process, but a combination of all things written above, you can say that we have a modular learning process, kind of agile approach that suits us better. Hrvoje Ivančić: I really like how the Magento 2 file structure is organized compared to previous version. However, working on the M2 project requires a huge effort and a good knowledge because the technology stack is modernized and several new technologies are embedded into it. This can be overwhelming for a developer. Ivan Miškić: Magento 2 development experience was very different compared to Magento 1. However, it was surprisingly easy to quickly get into all the new things that it brings, like dependency injection, factories and many more. Despite many troubles earlier during the installation, latest versions are much better and work without any issues. Events, observers and plugins make it easy to create changes throughout all core functionalities. On the other hand, some parts seem to require too much effort for not much gain, for example admin development. Magento 2 definitely does things better than Magento 1, but it still need some core framework improvements and has a lot of bugs to fix in core features. Now, I know Magento 2 can be confusing sometimes. Good learning process will definitely make it easier for you but in case you still need a helping hand of Magento 2 enthusiasts, feel free to get in touch, we’d like to help! Your article is informative, and gives us a good idea about the importance of internal training, thanks. One thing that is probably also helpful and could be mentioned, especially for other agencies, is how do you deal with the company investment into training? I mean, I know that we invested over 1000h of developer M2 training at Lero9 last year which is a significant amount and a real cost to business. How does Inchoo handle the cost of training?